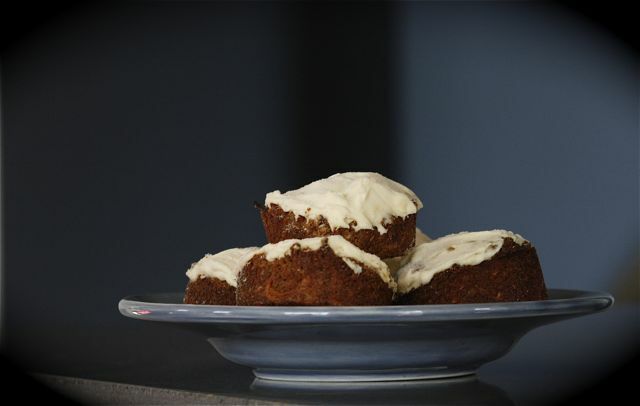 Carrot cake is a wonderful autumn comfort food. Make a batch of cupcakes and either freeze a few for a later time or make your friends smile by giving them away. We like using hazelnuts, but that is because we have a great source in Oregon. The walnuts or the pecans both make a fantastic cake. Enjoy!! Preheat the oven to 350 F. Grease and flour muffin pan or line with cupcake papers. Beat the eggs in a large mixing bowl with an electric mixer, and add the oil and apple sauce while the mixer is running. Add the vanilla, then sprinkle in the sugar and honey. You will have a thick, foamy mixture. Whisk together the flour, baking soda, baking powder, salt and spices in a medium bowl. Add these dry ingredients to the eggs and oil in your mixing bowl, mixing to make a smooth batter. Add the carrots, raisins, and nuts, then the coconut. Pour the batter into the prepared muffin pan. Fill each pan 3/4 full. Bake the cakes for 20 minutes, then check the middle with a toothpick to see if any batter sticks. The cakes are done when a toothpick comes out of the center clean. Cool completely on a wire rack then frost. This particular frosting is low in sugar but still acts as the perfect compliment to the carrot cake. Have the cream cheese cold. The butter can be cold, but preferably at room temperature. Combine in a food processor and pulse just until smooth and creamy. If the frosting is too stiff, pulse for a few seconds longer. Do not over process.